A broken belt is always bad news! When a belt breaks that means the water pump quits circulating coolant through the engine, the alternator quits charging the battery, the power steering pump ceases to assist steering, and the air conditioner quits cooling. Many newer vehicles have a single serpentine belt that drives all of the engine’s accessories, so when it fails everything stops working. Every time a belt passes around a pulley, it bends and flexes. This produces heat combined with age hardens the rubber and then the belt can start to fray or pile and become damaged to the point of failure. Ten out of ten serpentine belt failures end up causing a breakdown! That’s because the belt controls vital components to engine life and run ability! The good news is that replacing the belts periodically can go a long way towards minimizing the risk of a breakdown caused by belt failure. After all, it’s a lot easier to replace a belt at your convenience than having the belt fail unexpectedly. Belt squeal, when the A/C compressor is turned on or hard Power Steering turns. A battery that keeps running down (due to belt slippage). 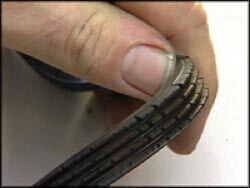 Cracks in a belt indicate that it is getting ready to fail and should be replaced.